To request a price quote for synthesizing a whole project, go to the ”Pricing” icon in the toolbar and click ”Project...” (Figure 1.13.1.1). Figure 1.13.1.1: ”Project” in the ”Pricing” drop down menu in the toolbar. The ”Pricing settings” dialog will appear (Figure 1.13.1.2). Select a supplier from the list and click ”Get quote”. 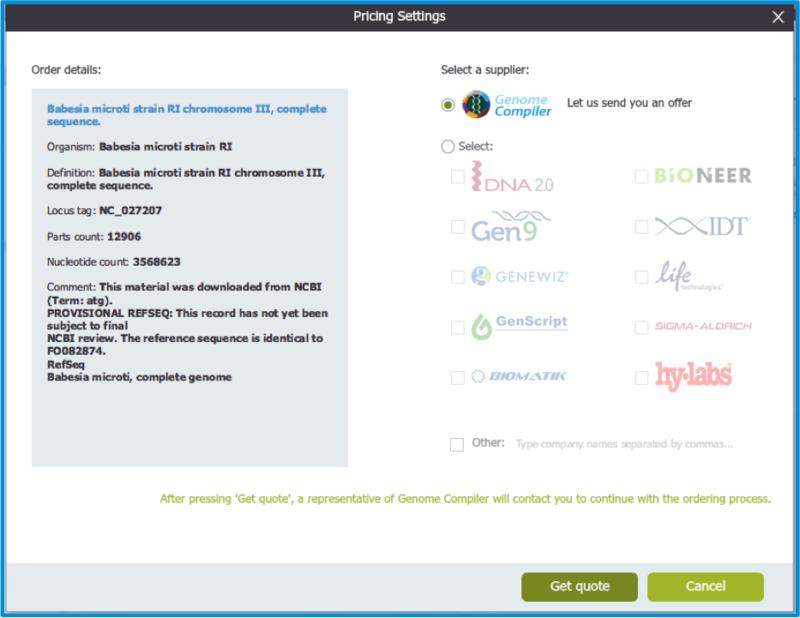 A representative from Genome Compiler will contact you to continue with the ordering process. Figure 1.13.1.2: The ”Pricing settings” dialog for projects.